It will create excellent edging effects for your paper crafts and scrapbook, suitable for Reductions photos, pictures, paper,ect. 6 X Creative Craft Scissors. Color: Random color, maybe will sent other colors not showed in the picture. Material:Plastic Stainless Steel. We will try our utmost to help you solve the problem. Foldable Design. Staedlter left handed scissors for children ensure high quality cutting. The scissors have a soft, ergonomic grip zone. Shape: 6 different Shape Decorative Scissors (Send randomly,Maybe not sent six kinds of different Shape Decorative Scissors). It will create excellent edging effects for your paper crafts and scrapbook, suitable for Reductions photos, pictures, paper,ect. These children's scissors are perfect for beginners or those that have trouble opening and closing scissors. SPRING ASSISTED CHILDREN'S SCISSORS. RIGHT HANDED. Useful for all art and craft projects that children want to be part of. Soft Grip scissors Easy Grip. Ergonomic shaped Soft Grip handle for very comfortable and precise working. Each pair of scissors has a unique pattern Material: Plastic Metal Designed to enhance a dramatic art piece Length of Scissors: Approx. 13.5cm/5.31" Great for scrapbooking or other forms of crafts High quality stainless steel blade A set of six different patterns Small fancy edged scissors suitable for Reductions photos, pictures, paper,ect. 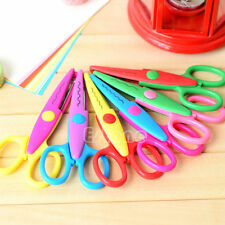 Small fancy edged scissors suitable for photos, pictures, paper,etc. Each pair of scissors has a unique pattern. 1 x set(6pcs) x Craft Scissors(other accessories demo in the picture is not included.). It will create excellent edging effects for your paper crafts and scrapbook, suitable for Reductions photos, pictures, paper,ect. 1 x Creative Craft Scissors. 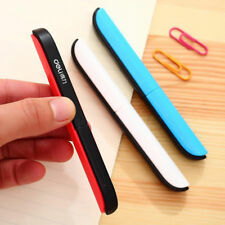 Smooth cutting, it will not rip or tear paper. 1 Scissors. other country. If you do not receive your winning. very best to resolve any problems with. Creative Stationery Tool Album Photos Card Paper Craft DIY Lace Scissors. Bright colors, fine scissors head. 1 Set Paper Lace Scissors. We will send you a correct one. Color: Show as picture,colors. MUIJI stainless scissors. material:stainless steel. Color: white (handle color is clear). full length:15.5cm. These stainless steel scissors feature a comfort grip handle. 2x Comfort Grip. 1 small pair and 1 large pair. STAEDTLER NORIS CLUB LEFT HANDED SCISSORS. Excellent quality scissors for children. Especially made for children's hands from three years of age and up! Left-handed version. Length: 14 cm. 3.1" Long Silver Tone Metal Mini Folding Paper Craft Scissors Made from metal material in silver tone, fold up, sharp blade, pocket size design, easy to carry. This Scissors cut and shred paper quickly and easily, suitable for any kind of paper crafts. Note: Be careful of the sharp blade, and keep it away from children. Brand Unbranded MPN Does not apply UPC Does not apply EAN Does not apply ISBN Does not apply. High quality stainless steel for the blade, scissors handle and the body of plastic material, clear and beautiful lace cut. To elect their favorite looks for DIY photos or cards, or cards to make pictures more flavor. Staedlter right handed scissors for children ensure high quality cutting. The scissors have a soft, ergonomic grip zone. Westcott Girls Pink Children's Kids Soft Grip Art and Craft Scissors 13cm / 5"
Blade Length 5cm (Total Length 13cm). 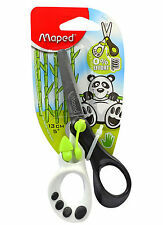 RIGHT HANDED CHILDREN'S HOBBY SCISSORS - SOFT GRIP. Useful for all art and craft projects that children want to be part of. PINK HANDLES. These can be used for cutting paper, card & most other materials and are designed specifically for younger users. PLUS Scissors SC-175SF White/Green 34-545. It will create excellent edging effects for your paper crafts and scrapbook, suitable for reductions photos, pictures, paper,ect. 1 x Creative Craft Scissors. Color: As the picture show (Send randomly, maybe will send other colors not showed in the picture. ). Ear Plug & Taper. Blunt blade don't hurt your hand. Nail Clipper. DIY Accessories. Good for DIY scrapbook, photo albums, greeting cards making and kids' artwork. Tongue Ring. Nose Ring & Stud. Eyebrow Ring. Right Handed Children's Safety Scissors. Ruled Edge & Pointed Tip. Stainless Steel Blades - Pointed Tip. Length 5" (13cm). Suitable for children aged 6 and above. Useful for all art and craft projects that children want to be part of.